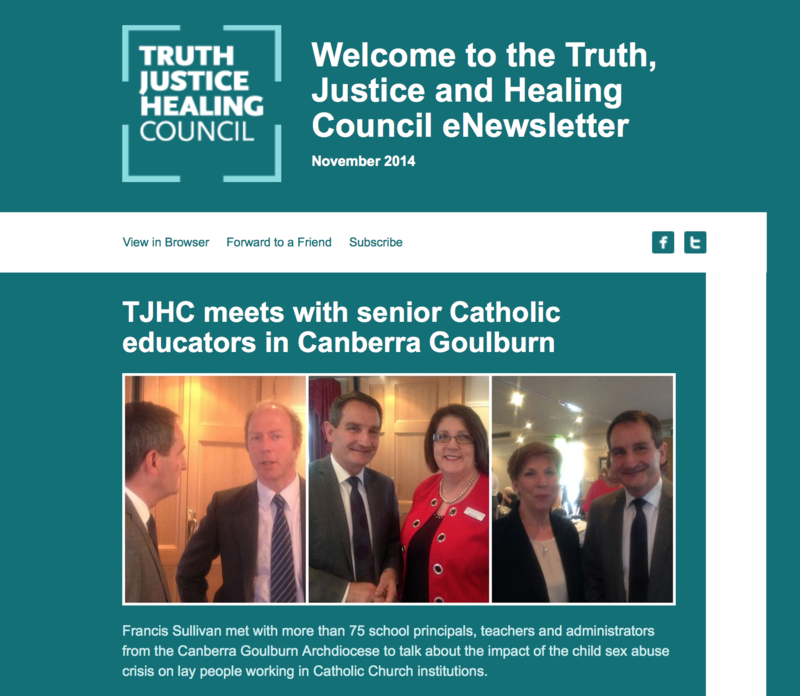 Towards Healing, the Catholic Church’s protocol for dealing with allegations of sexual abuse, was the focus of the fourth public hearing of the Royal Commission into Institutional Responses to Child Sexual Abuse. This hearing commenced on 9 December 2013 and returned on 22 January 2014 to complete the evidence in two of the four components of the Towards Healing case study. The Royal Commission into Institutional Responses to Child Sexual Abuse continued hearing public evidence today from Br Jeffrey Crowe, current Provincial of the Australian Province of the Marist Brothers, as part of Case Study No 4: Towards Healing. Br Crowe provided a broad profile of the 1046 Marist Brothers who have joined the order in Australia since 1948. He also provided evidence regarding the historic number of abuse cases, including the number of claims for redress, the number of active investigations, the average age of perpetrators and how perpetrators are dealt with by the order. Br Crowe also provided details of current abuse claims. In response to questions from Commissioner McClellan, Br Crowe discussed his thinking as to why the abuse could have occurred, including inappropriate screening and preparation of young brothers. Br Crowe also said that prior to 1970 there was a culture of restriction of contact with family and developing friendships. He also talked about the rigid discipline in religious houses prior to the 1960s. Details of today’s hearing also went to the details of the Brothers’ understanding in the past of what constituted a criminal act, and whether or not that attitude has now changed. Br Crowe took the opportunity to provide a public apology to DK on behalf of the Marist Brothers and committed to meeting with him soon. Michael Salmon, Director of the Professional Standards Office NSW ACT, returned to the witness box to provide further details of the Towards Healing facilitation process for DK who was abused by Br Ross Murrin at St Augustine’s College in Cairns in 1981. The hearing for Case Study 4: Towards Healing concluded today. The next hearing involving the Catholic Church, Case Study 6, is due to commence in Brisbane on 17 February. The Royal Commission today resumed hearing evidence from Br Gerald Burns, Marist Brother and retired principal of St Augustine’s College in Cairns during the time when DK was abused. Br Burns gave evidence about the DK Towards Healing facilitation meeting in 2010 and the knowledge he had of the behaviour of Ross Murrin who abused DK while he was a boarder at the school in 1981. Br Burns said he had no knowledge of Murrin’s behaviour towards DK at the time of the abuse of DK, nor was he aware of any other abuse by Murrin at that time. Following the conclusion of evidence from Br Burns, Br Andrew Moraghan, who was a teacher at St Augustine’s from 1979 to 1984 gave evidence. Br Moraghan also attended DK’s Towards Healing facilitation meeting in 2010. He gave evidence about his recollection of the meeting and his knowledge in 1981 of the activities of Murrin. Br Moraghan said he was unaware of Murrin’s sexual abuse and only became aware of his behaviour when Murrin was charged in 2008 and later sent to prison for his crimes. Mr Patrick Monahan, the solicitor who represented Catholic Church Insurance at both the DK and Jennifer Ingham Towards Healing processes also gave evidence today. Mr Monahan spoke about the role of CCI in the Towards Healing process and in particular his involvement in the DK process. He gave evidence about the way in which CCI assesses the level of compensation which could be paid to a victim including the extent of any psychiatric injury, the extent of the abuse and the needs of the victim. He was also asked by Commissioner McClellan about the factors CCI looks at when determining the legal liability of a church authority in a sexual abuse claim. Mr Monahan said this would include considering whether those in authority had any earlier knowledge of inappropriate behaviour by the perpetrator and whether there was a systemic issue. Mr Monahan spoke about the tension between the aspirations of Towards Healing to provide victims with a fair and compassionate outcome with the regulatory and other requirement of an insurance company such as CCI. “If this Commission can come up with some other system that doesn't contain that tension, I think that would be absolutely wonderful,” Mr Monahan said. Following the conclusion of Mr Monahan’s evidence Br Jeffrey Crowe, current Provincial of the Australian Province of the Marist Brothers, painted a picture of the Marist order in Australia since the mid-1960s, including the number of brothers, the number of students in schools and the social, cultural and religious reasons for the decline in the number of brothers. Questions to Brother Crowe also went to the legal and other processes put in place once allegations of sexual abuse are made and the processes involved in the development of child protection policies. Governance structures were also discussed and Cannon law as it relates to the discipline of Marist brothers and priests. Brother Crowe will continue giving evidence tomorrow. The Royal Commission resumed its hearing into the Catholic Church’s Towards Healing protocol with evidence from the NSW ACT Director of Professional Standards, Michael Salmon, into the case of a man, DK, who had been abused at St Augustine’s College, run by the Marist Brothers in Cairns. Mr Salmon acted as a facilitator during the DK Towards Healing. Much of today’s evidence has revolved around whether DK had been informed that Mr Salmon while acting as a facilitator was also employed by the Church and the extent to which this employment could be either a conflict or at least seen as a conflict of interest. Mr Salmon was also asked about the way in which Towards Healing operated around the country and the consistency of both implementation and outcomes. Mr Salmon said he believed consistency is something to be worked towards but the nature of individual cases and circumstances made it difficult to achieve. Mr Salmon said it was his view the facilitator in a Towards Healing process should actively support the victim and work to achieve the best possible outcome for the damaged person. “The whole practice and procedure of Towards Healing over recent years has been to get church authorities to come out of their bunkers and to engage pastorally with people like DK,” Mr Salmon said. Mr Salmon agreed consideration should be given to separating reparation from the pastoral component of Towards Healing. He also agreed the Church has an obligation to meet long-term costs relating to counselling. “The Church generally accepts now the devastating impact of abuse on some people and that for many, healing is a life-long journey. At the conclusion of Mr Salmon’s evidence Br Gerald Burns, Marist Brother and retired principal of St Augustine’s College in Cairns during the time when DK was abused, started giving evidence. Questioning focused on the understanding of what constituted sexual abuse at that time and how perceptions have changed since the early 1980s and Br Burns’ involvement in the DK Towards Healing process. Br Burns’ will continue giving evidence tomorrow. The first block of hearings into Towards Healing has concluded, with Bishop Jarratt from Lismore returning to the witness box to give evidence. Bishop Jarrett was asked about the processes in place in the Lismore Diocese for the management of priests who had a finding that there was a ‘semblance of truth’ in relation to an allegation of child sexual abuse. Bishop Jarratt was asked about a process instituted by the Holy See in Rome, shortly before he became Bishop of Lismore in 2001, which required all such priests to be referred to the Congregation for the Doctrine of the Faith. He said that he had not become aware of the existence of the process until representatives of the Diocese attended a canon law conference in 2006 after which the Diocese had instituted procedures to ensure that the process was complied with. After Bishop Jarrett finished giving evidence lawyer Peter Kelso, who represented Mrs Ingham during her Towards Healing facilitation, gave evidence about his involvement in her case including the terms of his cost agreement.  whether it was appropriate for Br Turton to have undertaken all the roles he did during DK’s Towards Healing process. Following the conclusion of Br Turton’s evidence the hearing was adjourned. The hearing of Case Study 4 will resume in the Commission on January 22, to conclude evidence in relation to the DK case study. The case studies being examined in Case Study 4 are focused on the experience of victims resident in Queensland. On the first day of the hearing the Royal Commission advised that there would be further case studies examining the implementation of Towards Healing for victims in other parts of Australia. It is anticipated these further case studies will be listed during 2014.